Are you worried that your baby might be a bit behind? Before jumping into any conclusions remember that each child develops at his or her own pace and the range of “normal” is actually quite wide. However, it is helpful to be aware of red flags for potential developmental delays in children. What does “developmental delay” mean? This term is used by doctors when a child has not reached an expected milestone in a certain time period. For example, if the normal range for learning to walk is between 9 and 18 months, and a 20-month-old child has not begun walking, this would be considered a developmental delay. 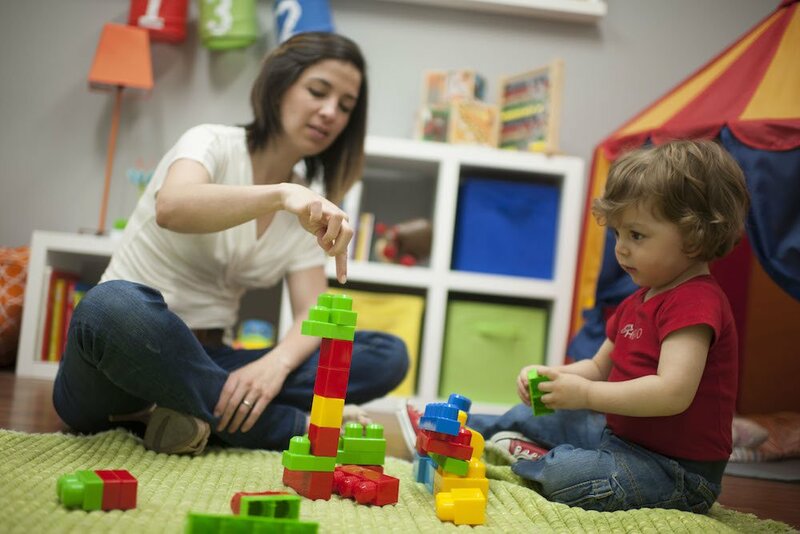 There are many different types of developmental delays in infants and young children, and they can occur in one or more areas such as: gross motor skills, fine motor skills, language skills, cognitive skills, self-help skills, social skills, and more. It’s important to mention that if your baby is temporarily lagging behind, that is not necessarily called a developmental delay. Remember that children develop at their own pace, so it’s important to know some of the red flags you should be looking out for. How can I know if my child has a developmental delay? A developmental delay is most often a diagnosis made by a doctor based on strict guidelines. Usually, parents are the first ones to notice that their child is not progressing at the same rate as other children the same age. Early intervention can make a huge difference, so if you think your kid may have a delay, you should see your primary care provider, or a developmental and behavioral pediatrician or pediatric neurologist. Remember that it is never a bad idea to familiarize yourself with the normal timeline of your child’s development. Just like adults, children sometimes work out confusing feelings or difficult experiences through their dreams. Even though hearing a sudden scream in the middle of the night coming from your little one’s bedroom is distressing– nightmares are quite common. 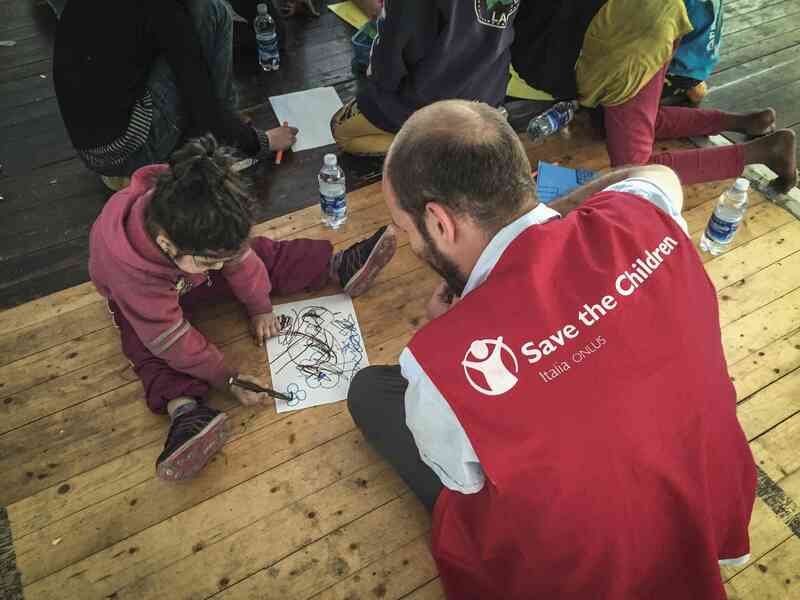 It’s important to note that all children have nightmares, regardless of their environment. Most parents will be concerned about a particular trauma their kid might have experienced, but nightmares can emerge with just telling a scary story (that may not seem frightening to you), going to the mall and your little one seeing a poster of an animal that he finds frightening, or finding a scary item. Later in the night, these scary stories or objects might find their way into your child’s dreams. This happens because children at this age have a hard time separating fantasy from reality, which can lead to fears and, thus, be vented through dreams. What can you do to deal with your child’s nightmares? 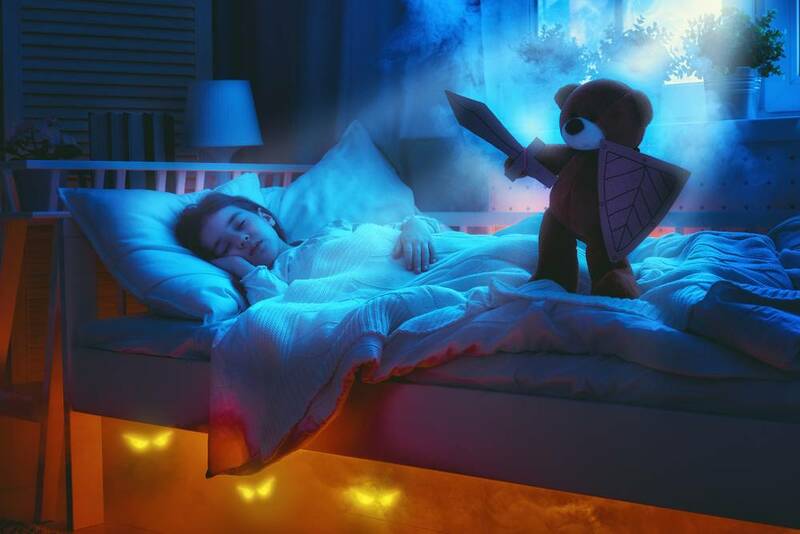 While it is true that every child has an occasional scary or distressing dream, nightmares seem to be more frequent during the preschool years when fear of the dark is common. Another thing that is important about nightmares is that they happen closer to the morning, in the late stages of REM sleep. This is an important characteristic as it differs from night terrors, which happen during the first few hours of sleep when your child is sleeping deeply. After a nightmare, it may be hard to settle your little one back in bed, but it’s important you do it since he needs those few hours of sleep. Go to your child when he cries out and provide physical reassurance -you can start by hugging him and rubbing his back until he calms down. You should also reassure him that everything is okay by explaining that the dream was just like a movie playing in his head and when he wakes up “the movie turns off”. You can also ask him about the dream. Even though your child won’t be able to explain it in detail -since he is just developing his linguistic skills– talking about it can help him process the event. Don’t forget to really listen to your child’s worries –don’t dismiss them! Another thing you can try is showing your little one there are no monsters under the bed or in the closet (if that is his fear), or you can even come up with a “happy ending” for the dream the next day. When summer arrives, it comes with warm, sunny days that are ideally spent splashing around in a pool. Thinking about going for a swim with your little one? Here are some safety guidelines you can follow to make sure that it’s a smooth experience for everyone. When people are not using the pool, keep toys away from it. Blow-up pools should be emptied after each use. No riding toys near the pool (bicycles, tricycles, etc). Keep electrical appliances away from the pool area. If you have been paying close attention to your baby, you have probably noticed that before she can even talk, she has been trying to communicate with you. Crying, pointing, smiling, and laughing are all forms of communication and, although at first it can be a guessing game, with time and effort you can identify what your little one means. If you wish to better understand your baby’s needs and desires, you could try a personalized version of baby sign language. Baby sign language is a communication tool that seeks to motivate babies to communicate with gestures. It works by using manual signing that allows babies to communicate their wants and even their emotions before they can talk. This form of communication decreases frustration, promotes language development, and helps increase the parent-child bond. The evidence regarding these claims is still limited, but there has been lots of praise and positive anecdotes from parents and professionals who use this tool. Complementing language with gestures and signing might diminish the frustration experienced by children who know what they want, but still do not have the verbal skills to express themselves. Signing with babies is a promising and interesting field for research. Preliminary findings have identified that being attuned to their little one’s gestures motivates parents to be more mindful of their baby’s unique forms of communication, leading to a decrease in miscommunication and, therefore, supports a healthy attachment.